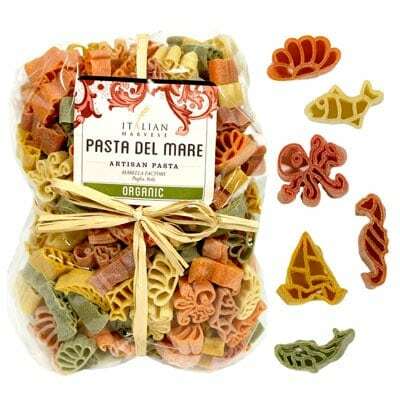 One of the many adorable creations of artisan pasta maker Marella, this bag of Pasta del Mare Sea Theme will be a sure hit at your next family dinner. Trust us, adults and children will find it hard to resist your pasta dish. With all natural and organic ingredients, you can serve this with any pasta sauce you like. Or if you want something more apt, serve it with real seafood bits. You and your family will have great fun and be able to satisfy your hunger, at the same time! Creative and colorful, this pack has 8 different fun shapes of seafood creatures that will surely bring out the child in you. So grab a bag of this unique creation from Marella now!